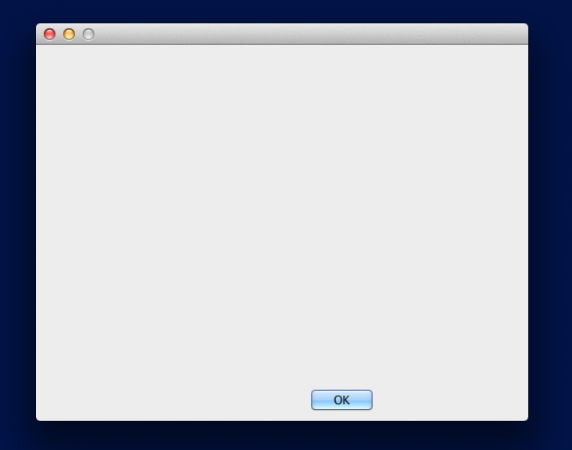 All of a sudden, when I try to run the installer for the Amsterdam airport on my iMac, I get a blank window without anything but a "ok" at the bottom. Nothing happens when I click on it, so Im not able to run the installer or type the serial key. I did some testing, and the same thing happened when I tried to run the installer for my other previously installed airports. I have never encountered anything like this before, so Im completely blank about what to do here Any help will be most appreciated. same here, cant install either and yes also same screenwindow. i have send the problem to our programmer (installer).... We must check it. I am having a duplicate issue on the same OS with the PANC installer. I did break through to the installer UI once but i've had no further success. But our specialist for X-Plane 10 installer is some days absent... so we must wait ... sorry. If there is a file 1.6.0.jdk into the folder System/Library/Java/Java Virtual Machines/ then please delete this file. But make a backup of the file before and save it to another location. Now run the installer again and when the MAC ask whether it should install the latest Java VM, then answer with "yes". I have trouble installing Zurich Airport the Linux version. May be you have to choose the X-Plane 10 Folder like this: home/pbt/"X-Plane 10" or "home/pbt/X-Plane 10". And then try to run the installer again. Just installed Amsterdam...it went ok like you said and yes it asked to install Java 6.
its good that it works now. Thanks for your info. And yes, since X-Plane 10.20 some files were renamed.... So some of our first installer don't work.